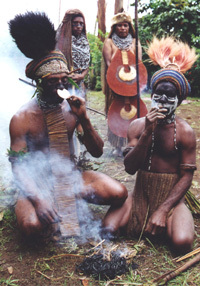 Exploring tribes in Papua New Guinea`s highland! 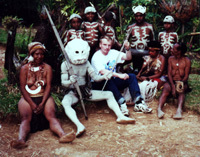 When I took my first steps in the rural areas in Papua New Guinea, I wondered about how I would be greeted. The tribes are still fighting and blood revenge is widely practised; an eye for an eye, and a tooth for a tooth. Photo. Strange rituals performed by the Melba tribe. As I knew from the history, the Highlands in Papua New Guinea (PNG) were thought to be uninhabited. When the gold miners ventured up from the coast in the 1930s. They discovered over 100,000 people living in the highlands in a Stone Age-style unaware of the outside world. The white man's intentions were seldom in the interest of the local people, and it lead to many serious conflicts. The Highlands were discovered by Australian explorers delving into the unexplored interior of Papua New Guinea in search for gold in the beginning of the 20th century. They were amazed to discover a whole nation of people living in a fairly advanced agricultural society that had had no previous contact with white men. The Highlands has the most people of all of Papua New Guinea. Highlanders are comprised of a number of different tribes scattered across the Highland plateau surrounded by mountains. Traditionally they live in clans which comprises a group of families living in small agrarian communities and protecting each others interests not uncommonly by fighting small skirmishes with neighbouring clans (which usually doesn't result in casualties as the clan in that case has to pay a severance to the family of the deceased). The largest tribe are the Huli wigmen, who are famous for their tradition of growing ornamental wigs from their own hair. During my travels there the previous year, I experienced an overwhelming nature. The countryside is dramatic, with wide fertile valleys, numerous rivers and steep mountains. The highland is the most densely populated and agriculturally productive region of PNG. Here you find little of what reminds you of a modern world, but I was not certain what kind of life they lived now in the rural areas, and how far the modern way of living had reached. Photo. Joining the Melba tribe. Friendly communication between people from different worlds. Exploring tribes in the highland is extremely interesting. You can meet two different tribes which lives on each side on the road, and have a totally different language and culture. They have all colourful costumes, strange ceremonies, and are proud of their culture. Photo. Jiwaka performed the terrifying skeleton to dance to honour us. They looked like ghosts moving around. Photo. I got on very well with the Jiwaka people. Some of them like to scare us with aiming at us with bow and arrow, but it was nothing to worry about. It was just a practical joke! The Jiwaka tribe's hospitality was faultless, and they took good care of us. But not everybody has been greeted and welcomed as well as we were. In their Haus Tambaran, a house where the spirits live, human sculls were put on display. Photo. Mother and her very nice, but shy daughter. They were dressed up in their finest clothes to honour the guests. Photo. A human scull in the Jiwakas` Haus Tambaran (spirit house). I wouldn`t like to end up here to be displayed as this poor person in the middle. It is definitely a place I would not like to be displayed! As late evening came, it was time for eating. The chief was hungry and looked forward to a delicious meal. Photo. 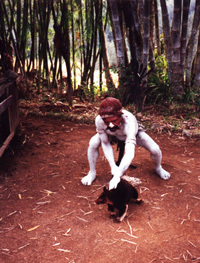 The Chief in the Jiwaka is playing with the evening's dinner, a big rat. Good appetite! I still wonder how this rat would have tasted. It`s hard to imagine, but I think is best to forget it. But anyway it`s probably better than McDonald Hamburgers! For a while I forgot that I was hungry. So I had to hurry. "Unfortunately" I didn't have time to join them any longer for dinner. I had to move quick further to discover more of the unique culture and unspoilt nature around. Good excuse, wasn't it? Today many of the tribes make a living through subsistence agriculture, growing sweet potatoes, corn, sugarcane, bananas and a great variety of green-leafed vegetables, and raising pigs. Their land is suitable for coffee-growing and many families have re-located their homes from more traditional areas, At higher altitudes, in side valleys to Wahgi Valley, at about 1600 metres altitude, conditions for coffee production is better. There is no doubt that PNG is one of the last frontiers. My journey through Goroka, the Hagen area and the huge Wahgi Valley was like travelling between different worlds. The contrasts were great. On one hand I could see a contour of a modern world, and on the other hand people lived almost as they did in the past. Anyway it gave me an exciting and adventurous experience for life, and I managed to return fully unwounded from the highland bushes. Stein Morten Lund, 14 July 2000. 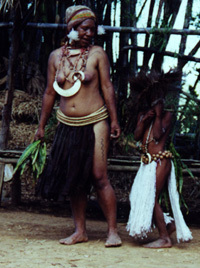 Read more about Exotic Tribes on our site. 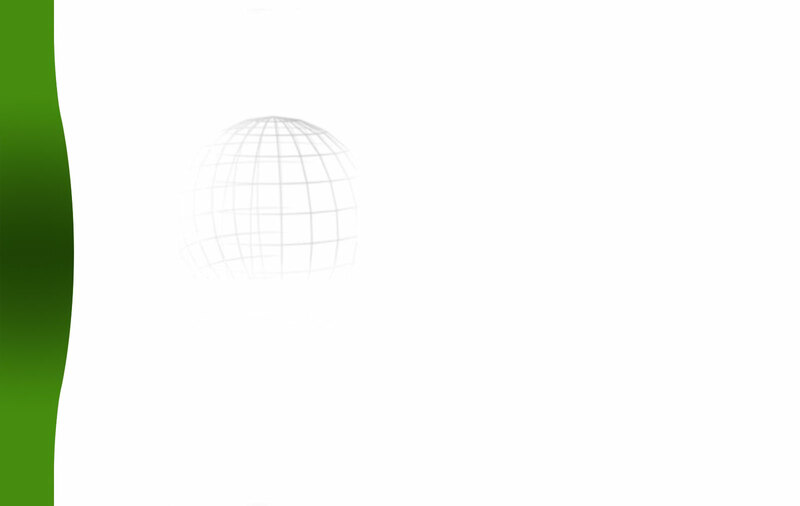 The world is bigger than you think!